Where’s the catchy superhero music? From the trailer, it looks like this is going to be a comic book movie. The reality is far from it. Throughout the film we constantly hear a voice talking to Riggan (Michael Keaton), a washed up actor that has never managed to reclaim the fame that he achieved by playing Birdman (as in the title). 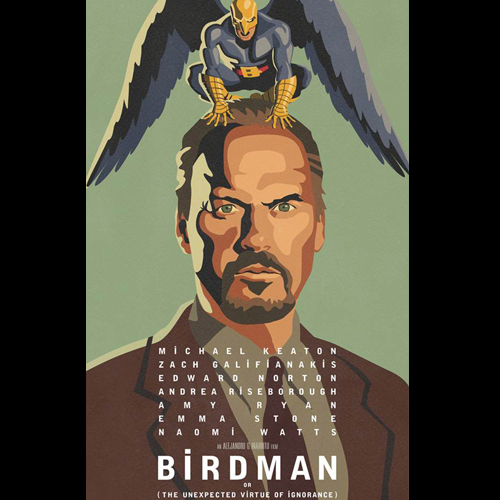 With everyone expecting him to make a fourth Birdman movie, he turns his eye on Broadway in one final effort to break free of Birdman, the character that has become more recognisable than he has. Even to himself. The voice that we constantly hear belongs to Birdman, constantly judging and berating Riggan as he goes through his mid-life crisis. The film follows the days leading up to the opening night performance whilst Riggan deals with his family, the problems with his play, and the needs of his alter-ego. Birdman! For the majority of the cast the acting is flawless. Not only does Keaton deliver his best performance since Beetlejuice, but Edward Norton might even deliver what he does in the play in real life. Portraying a method actor that has joined the cast at the last minute, Norton’s character tries to steal the show from under the nose of Riggan. Norton may steal the show away from Keaton as the range and acting and emotion delivered is truly something to behold. On-the-other-hand you have the females of the film that are easy to forget: Naomi Watts is hardly featured and Emma Stone does such little acting in the film that her part could have been written out. It’s the gentlemen that steal the show. Despite the distorted reality involving the scenes surrounding Birdman, the film is truly magical. Although the open-ended finale seems like a cop out just so that the audience can imagine whatever they want, Keaton’s portrayal has to be put down as one of the best of the year due to him being back at the top of his game. Where has this performance been for the last decade? Fair play to Alejandro González Iñárritu. Though it won’t be close to the highest grossing movie of the year, it’s definitely close to being the best. Tagged 5/5, Comedy, Film, Review. Bookmark the permalink.